Having skied Big Sky Montana, I agree with the Big Sky state motto: “the last, best place.” On our first Big Sky visit our family was wowed – not by just the big blue sky but by the big mountain skiing. Lone Peak is the crown of Montana’s Big Sky resort at 11,166’; it is highly scenic, and superbly steep with plenty of snow. 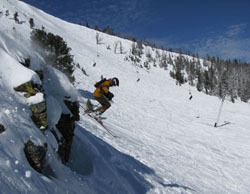 That first Big Sky ski trip was 2005, its gotten busier, but its still among the best ski resorts in North America. It takes days to exp lore all of Big Sky’s 5,800 skiable acres. Big Sky has everything on the menu, above tree line bowls and chutes, glades, blue square boulevards, in fact you can ski all that in one 4,350’ vertical run. And now that Big Sky includes Moonlight Basin and Spanish Peaks, it truly offers some of the biggest skiing in America with seven mountain aspects and 34 lifts, including a bubble six pack in The Bowl below Lone Peak’s Tram. Skiing Lone Peak’s summit with our kids, after riding the exciting 15-passenger expert’s only tram (like an aerial elevator) was amazing. We were all amped, and a bit out of breath, at our Big Sky big mountain ski down steep but soft snow in Liberty Bowl. Our son was stoked to do it again, only steeper next time, so we dialed it up a notch in Dictator Chutes (Marx, Lenin and Castro). We did not muster the courage (or the required avalanche transceivers and shovels) to ski The Big Couloir – a legendary chute amongst extreme skiers. Maybe next trip – because there will be a next. Aside from Big Sky’s four mountains of skiing, there’s plenty to soak in after the lifts close too: At Big Sky’s Summit Hotel – the outdoor pool, the live après ski music at the Carabiner Bar in cozy cowhide chairs, and fresh pasta at stylish Andiamo’s. For the best Big Sky restaurants, we like Everett’s 8800 on the mountain for a highly scenic ski lunch and the best Montana steakhouse is Buck’s T4. 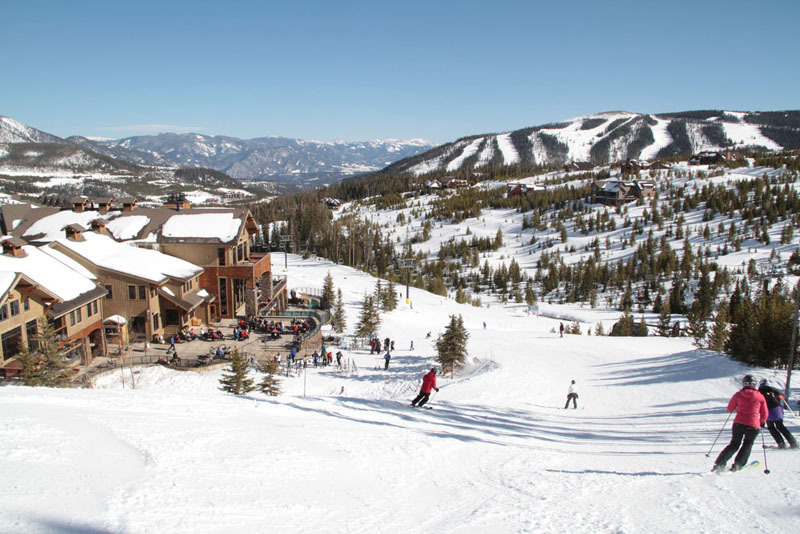 Big Sky lodging ranges from the swank slopeside Summit Hotel – my personal fave (the bellman are cowboys and the décor is rocky mountain elegant), the Shoshone and Huntley Lodge, or spacious mountainside condos like Lake Condos or Big Horn, or a cabin at Moonlight Basin. For young families, kids 10 and under ski and stay free at Big Sky (with paying parents – don’t just ship your kids out), and there’s free Kids Club in the evening. You can take time off the slopes for dog sledding, zip lining, or a winter tour of nearby Yellowstone National Park. 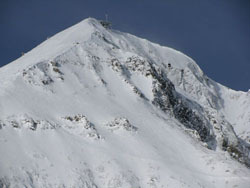 For extreme skiers, Lone Peak is a beacon for big mountain steep and deep. And you can access Big Sky’s Northern Exposure Moonlight Basin and the Headwaters venerable terrain. 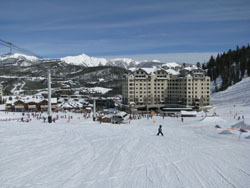 In 2013, Big Sky acquired Moonlight Basin from Lehman Brothers, along with Spanish Peaks, with investment from the private club next door – Yellowstone Club. Big Sky’s Moonlight side offers 2,200 acres of great skiing, lots of snow, steeps and some sweet groomed runs off the Six-Shooter lift. Big Sky Resort is beautiful, big and abundant. We love roaming the Big Sky state, meeting the occasional big horn sheep on the roadside. The snow and the scenery are amazing. Go to Montana to ski the last, best place.